The sweet taste of strawberries is easy to get in this No-Churn Strawberry Ice Cream with homemade strawberry jam. Are you ready for another flavor of No-Churn ice cream? 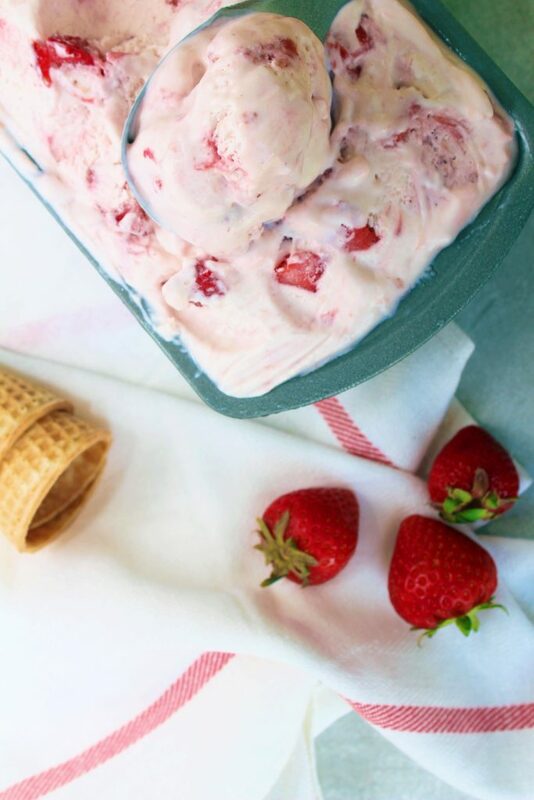 Presenting No-Churn Strawberry Ice Cream. Today I went a step further and made my own strawberry jam/syrup to add into it. Did you know how easy it is to make your own strawberry jam? I didn’t either. Now that I do, I’m totally going to be making more. I’m one of those people who always buys strawberries because they look so tempting but then they turn bad before I can finish them all. Tada. Now I have a solution. You can easily make this tasty strawberry jam and then freeze it for future use. It is amazing on the Oreo Pie Dip I shared recently and in this ice cream. 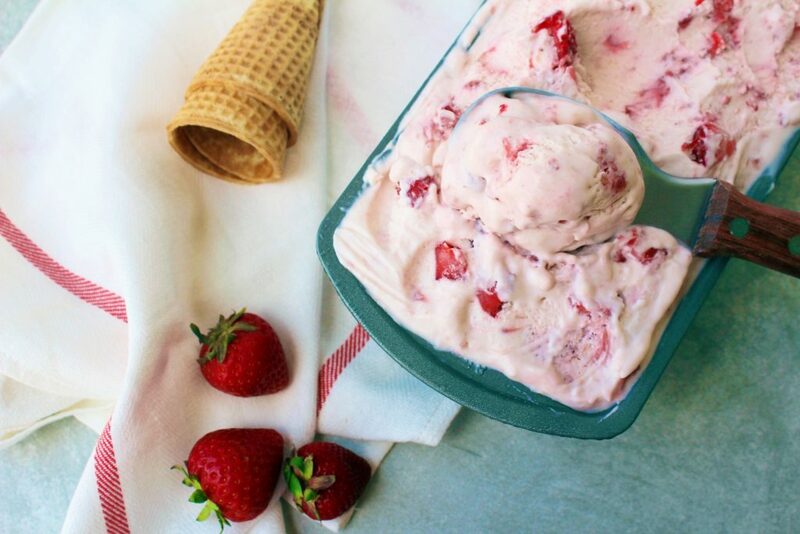 I had some store bought strawberry ice cream and I have to say, I liked this one better. Shameless plug here. Whether or not you want to add pieces of strawberry to the ice cream is up to you. They do get frozen (duh) so if you don’t like biting into frozen strawberries, I would leave them out. My taste testers were torn – some loved the bit of frozen strawberry and some didn’t. But all agreed the flavor of the ice cream was incredible. 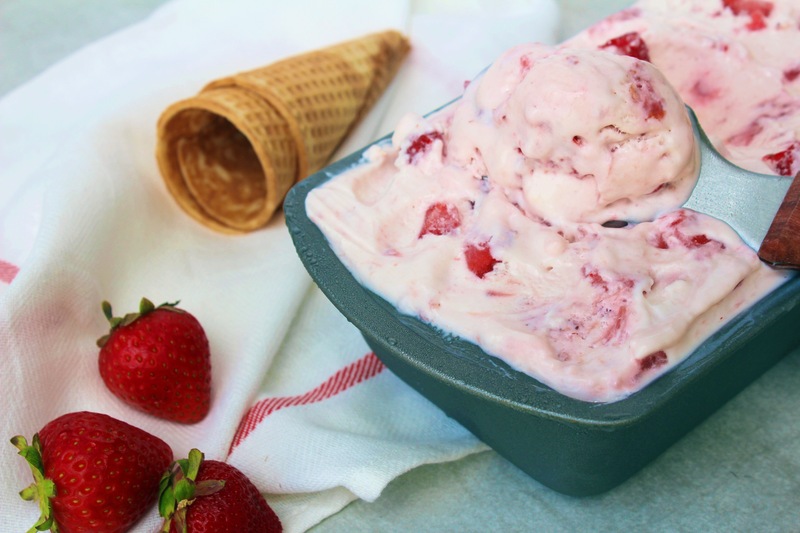 Enjoy this No-Churn Strawberry Ice Cream as summer is winding down as a special treat. 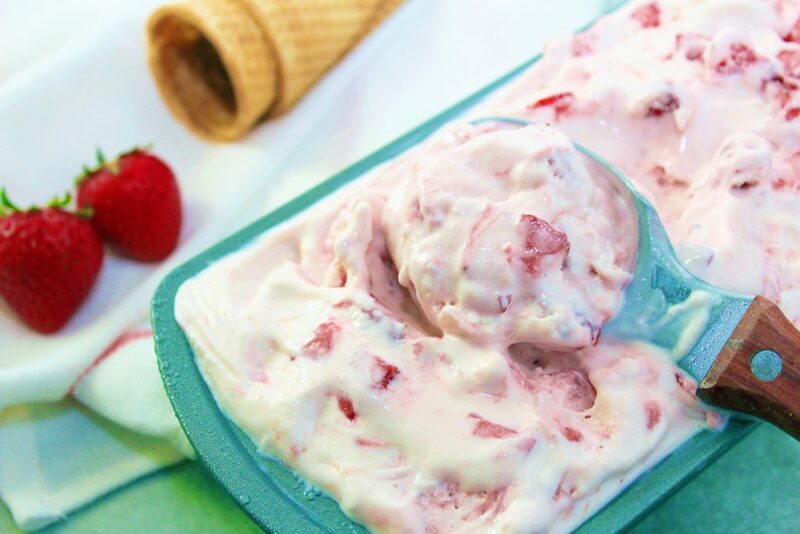 The sweet taste of strawberries is easy to get in this No-Church Strawberry Ice Cream with homemade strawberry jam. Place cut strawberries and sugar in a medium saucepan. Cook over low to medium heat for 15 minutes or until strawberries break down. Take off heat and add almond extract and whisk together. In a large mixing bowl, whip cream until stiff peaks form. Add condensed milk, strawberry jam and vanilla extract. Mix to combine. Start with 1/3 c puree and add additional if more flavor is desired. At this point you can add in strawberry pieces or layer when pouring ice cream mixture into loaf pan. Once you add ice cream mixture to loaf pan, cover with plastic wrap being sure to press the wrap to the top of the ice cream so ice crystals form on the ice cream. Freeze for 6 hours or overnight.